Given my local sensibilities, foraging the wild for edibles is near and dear to my heart. But seeing as I live in the middle of suburbia, the opportunities for foraging are few and far between. That’s why when I spied blackberry bushes starting to flower along the walking path in my neighborhood, I vowed to keep a close eye on them. In June, the blackberries were faring nicely. Red berries in need of some rain and sun in order to turn ripe and plump. Unfortunately, we had two heat waves and minimal rain, so when I put on my foraging hat and headed out to pick the blackberry bounty, I was disappointed. 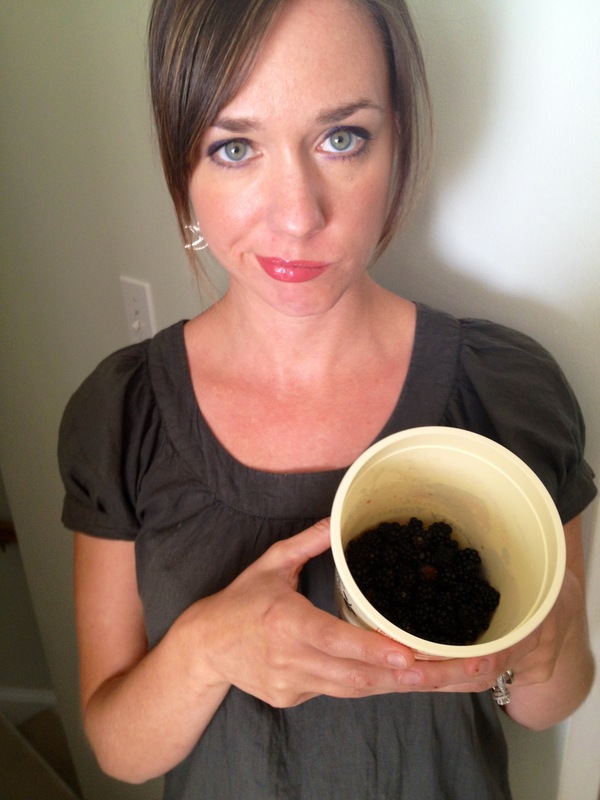 I searched far and wide, only to find about a half a pint of blackberries. They were measly, not at all like the large, sweet berries I picked as a child. From the looks of things, neighbors and deer also liked the idea of foraging, leaving me to fight brambles for the hard to reach berries. I didn’t let my disappointment get the better of me. 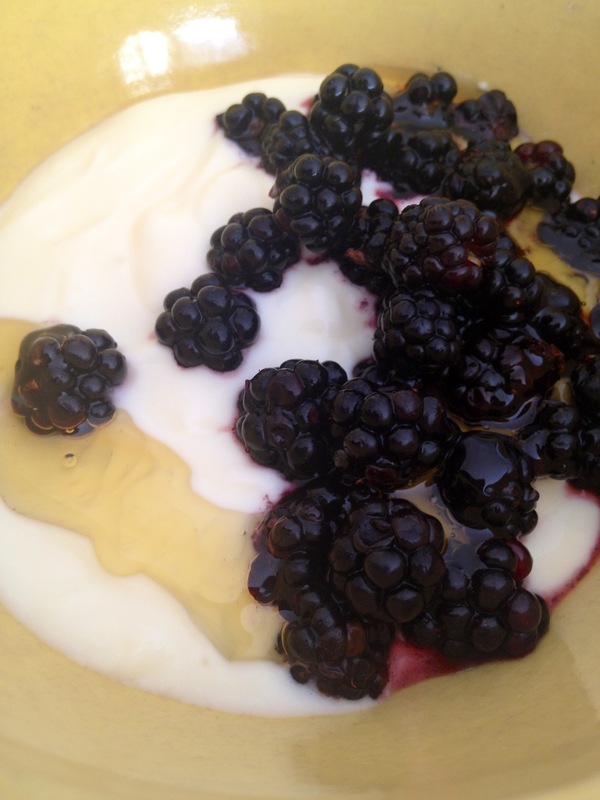 Instead I scattered the dark berries on top of Pequea Valley Farm Yogurt and added local honey. 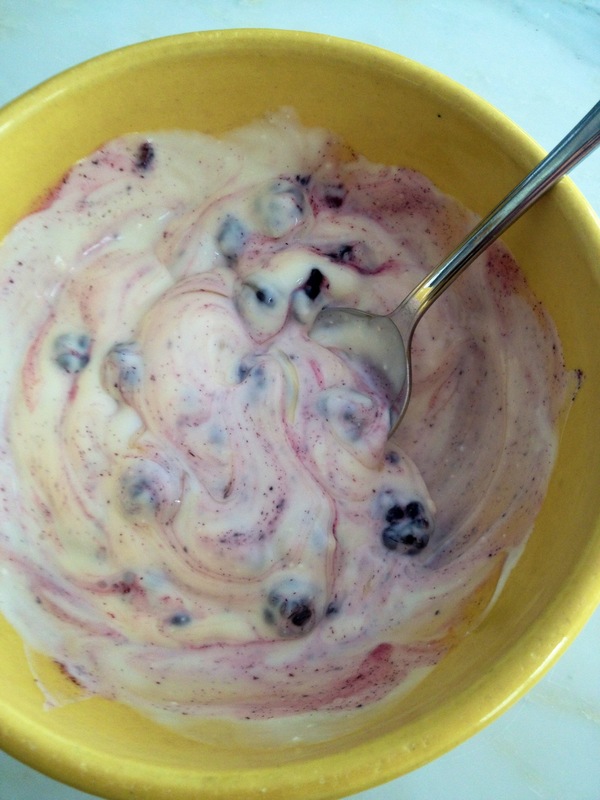 Mixed together, the yogurt, berries, and honey made a delightful breakfast. Who needs fruit on the bottom? What edibles are forage-able in your area? Tell me; I’ll try not to be too jealous. Nice to see you here, my friend! If I could play blog-matchmaker, I’d have intro’d you and Rachel. So glad to have found Rachel here — and you, dear, are a tremendous match-maker. You should start e-Blogfriender, or something like that. It could be your money-maker. Rachel, my dear, I was hoping to be in the 2nd place running, but it appears my friends did not line up behind me like I hoped. (Turns out they have Facebook “like” aversion and thought this was kinda the same thing). I will totally vote for you again in the face-off next week (you do know I voted for you and not myself, right?). You voted for ME? I’m oddly flattered. We were so close for a while! I thought you were a shoo-in with your feathered hair and velour shirt. Maybe the fact that I didn’t have braces yet put me over the edge. I don’t deal with chiggers here, Shannon, but the brambles are no fun, especially when not dressed properly. I had on shorts and a tank top. That looks like a pretty good breakfast to me. I think its pretty neat that you picked your own berries. I like to forage for bacon. Wow, that is the very picture of disappointment. My best foraging experience ever was up in Alaska. I was in the forest, looking for mushrooms, when I discovered some wild blueberries. Looking further, I found wild raspberries… and went on to find several more kinds of totally wild berries. I collected a huge bucket full of them, took them back to the house I was renting, ate as many as I could and froze the rest to bring back home to California. Why must you ALWAYS one-up me?? Hey, I have to go all the way to the 49th state to one up you. Even going to the 49th state is a one-up. 🙂 You know I’m teasing; I love hearing about your culinary adventures. I adore your disappointed face, Rachel – adorable! We get to pick blackbarries down the lane too, even one breakfast is enough to make it worth it – so much fun! Oh thanks Rachel! I’d love to do coffee :)!! Totally dig th foraging! Yummy, yummy! I eat a greek yogurt-granola-berry (sometimes peach) parfait nearly every morning for breakfast. I think I need to start doing my own foraging. Foraging is fun and FREE! I just wish I could find more places to forage. Suburbia doesn’t lend itself to much foraging, but it does lend itself to after school specials, acid washed jean jackets, and fodder for your blog! You are so right there, Rachel! A friend picked wild blackberries & shared them with me last week, and I did the exact same thing with them! 🙂 After eating most of ten plain on the way home of course. Of course! These blackberries were on the slightly bitter side, so they needed the honey. I love fresh fruit and yogurt. Next year you are going to fight the brambles with me! I really love to forage but where I live, it’s never something as recognizable as blackberries. Cactus buds? yeah – think you’ve motivated me to do a post about it. OH man, they really don’t look meager in that picture. Nor does your hotness in that picture, I might add. Your eyes! Gorgeous. I think the apple/pepper exchange sounds glorious. That’s the way life’s supposed to be! Honey Crisp apples are my favorite. You’ll have to find yourself one come fall. How were your fab friend’s apples? Blog-worthy? I totally agree it’s how life should be! And Honey Crisp apples are my fav, too! (It used to be Gala until the HCs came along.) They’re the shiz. These are pretty good, but they’re no Honey Crisps. Now I can’t wait til fall. I want an apple right now.